I think future generations will look back and say that mass tourism was the curse of the early 21st century. Whereas people of my parents’ generation were happy to make themselves a home, carrying out DIY, and tending tomatoes in the greenhouse, the succeeding generations (including my own) crave experience, a situation stimulated by cheap air travel, media coverage and the unaffordability of buying a place of one’s own. The more popular the experience, the more tourist pressure, and destinations such as Venice seem to be sinking under the weight of crowds of low-spenders that give little to the local economy. Japan faces a particular problem in that many of its greatest sights are dry gardens (karesansui) intended for quiet solitary contemplation and spiritual enlightenment, and large parties of boisterous chattering Japanese schoolchildren and western tour groups make this an impossibility. At best, there is a tantalising glimpse of what might be. Ryoan-ji (The Temple of the Dragon at Peace) in north west Kyoto is one of the finest dry gardens, and has the added bonus of a great water garden. 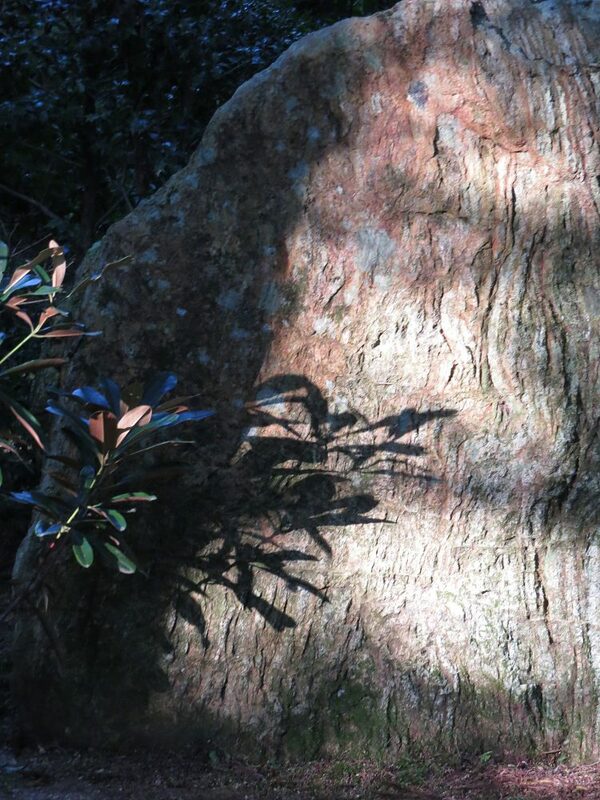 The site was originally a country house, acquired in 1450 by Hosokawa Katsumoto, a powerful warlord, for use as a personal residence and Zen training temple. Destroyed in the Onin Wars, it was rebuilt by his son in 1499. The first written description of the dry garden dates from 1680 when it had nine large stones supposedly laid out to represent a tiger and cubs crossing a river, but in 1779 the temple was destroyed in a great fire, and the rubble dumped on the dry garden. The new garden, built at that time on top of the rubble, by garden specialist Akisato Rito, had fifteen stones and looks as it does today. To the outside of the garden wall the ground is 80cm lower, and because of the heightened elevation the garden gained a borrowed view of the mountains, now sadly hidden by trees. 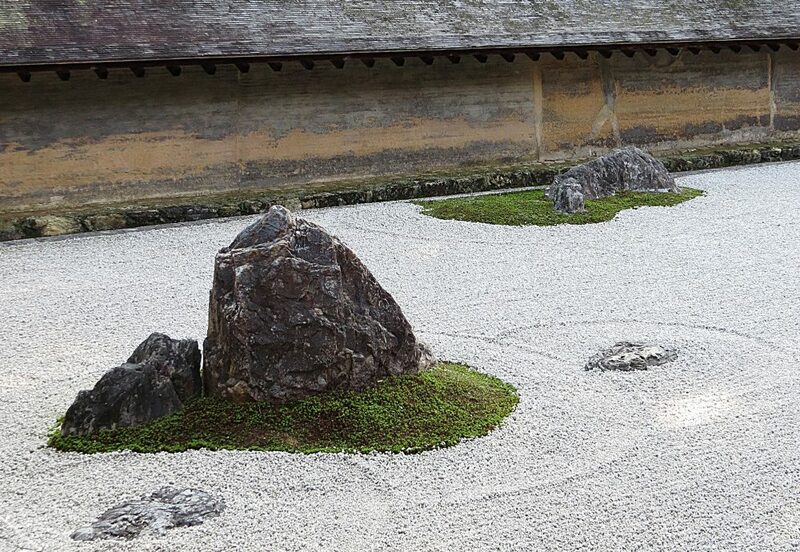 The fifteen stones of different sizes are carefully composed in groups; two groups of three stones, two of two, and five isolated ones and are surrounded by gravel which is carefully raked by the monks each day. 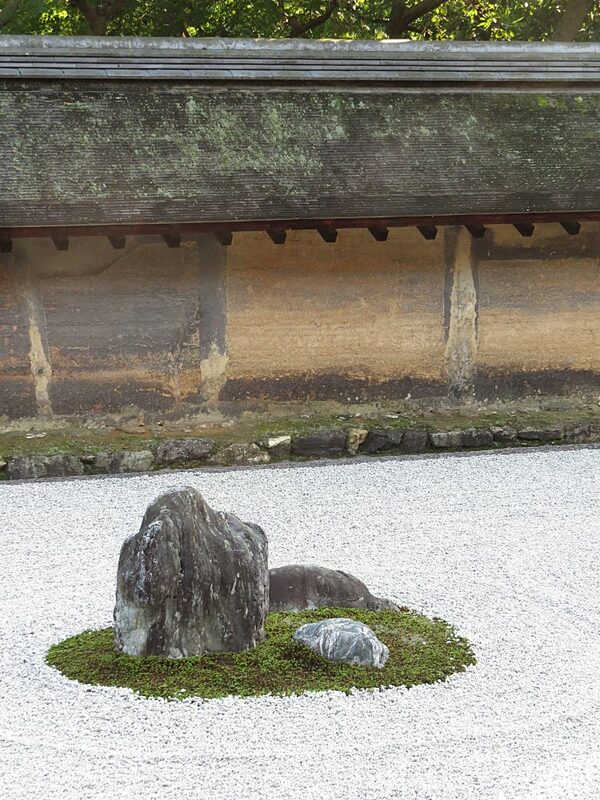 The only vegetation is moss around the stones. The surrounding walls are of an interesting construction, being of clay boiled with rapeseed oil which over time has stained the surface with subtle brown and orange tones, built over stone base courses. The traditional coping to the wall is a roof of tree bark shingles. 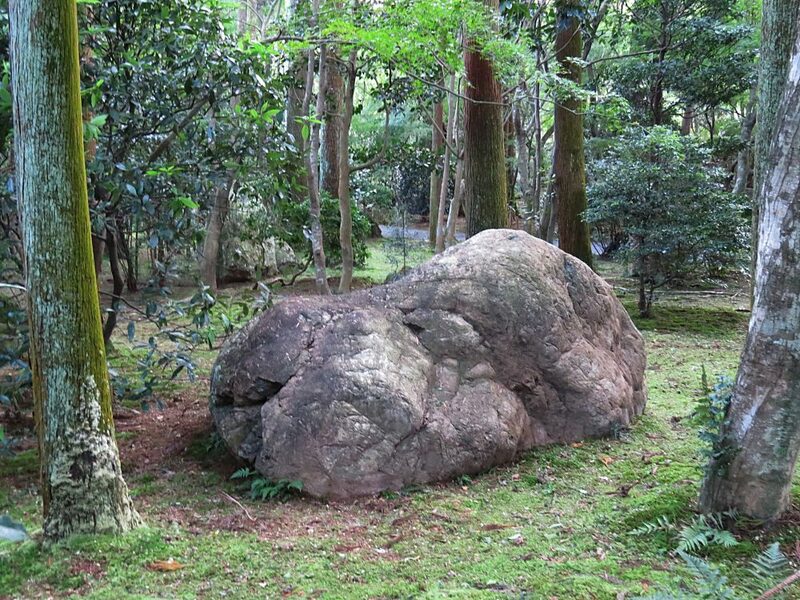 The rocks are arranged so that only fourteen may be viewed at any given time and from any angle. 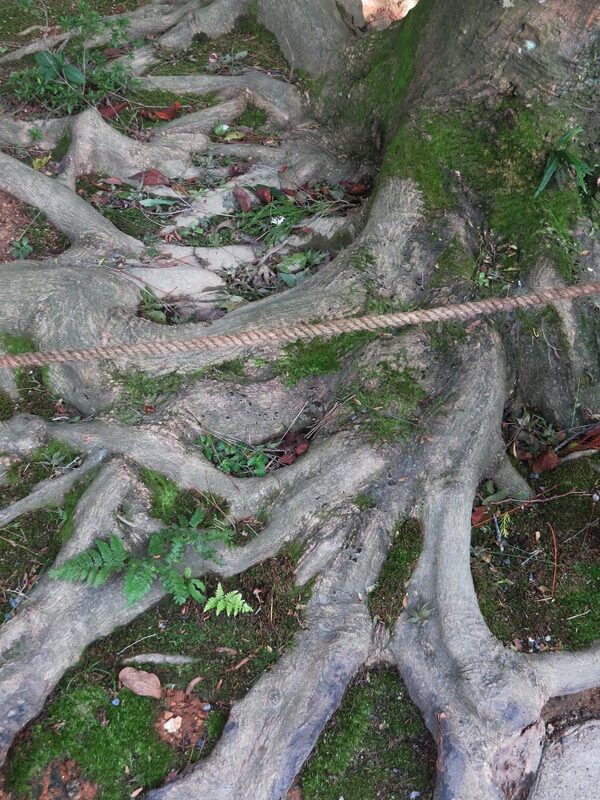 This arrangement is a Zen riddle (koan). Only through attaining enlightenment will one see all fifteen stones simultaneously, something easy to say but (except for a highly trained Zen monk), impossible to experience. 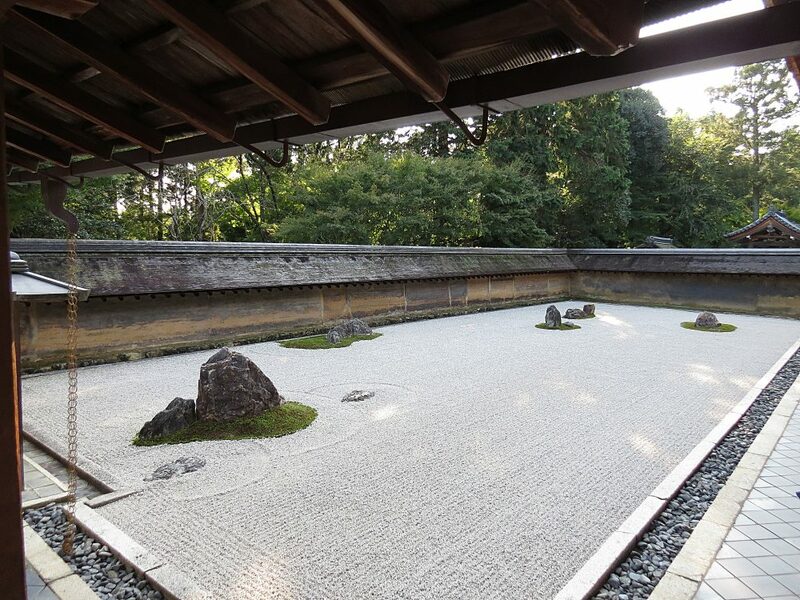 The garden is meant to be viewed in quiet contemplation from a seated position on the veranda of the Zen Master’s hall (hojo) until that moment of enlightenment. The water garden, known as the Kyoyochi Pond, dates from the 12th century, and is an artificial lake fed by natural springs built on a sharply falling site, with an outfall in a deep cutting. There is a small island joined by a causeway and bridge to the pond’s edge that has a Shinto gate (torii) and wonderfully peaceful Shinto shrine. Water gardens are the oldest type of Japanese garden, predating stroll gardens by several hundred years, and because the one at Ryoan-ji is a thousand years old it is difficult to know how much remains of the original design. The walk around the lake is completely shaded by trees, and attention soon becomes focused on the rocks, the patterns of the surface tree roots and the moss. It was a strange and mysterious experience, and I felt compelled to walk around a second time because to a Western eye the rocks seemed alien and primeval in their setting (unlike those in the dry garden). They are of differing types and sizes of stone, some grouped, some solitary, some looking like modern abstract sculptures of animals, some covered in moss but almost all beautiful and interesting. 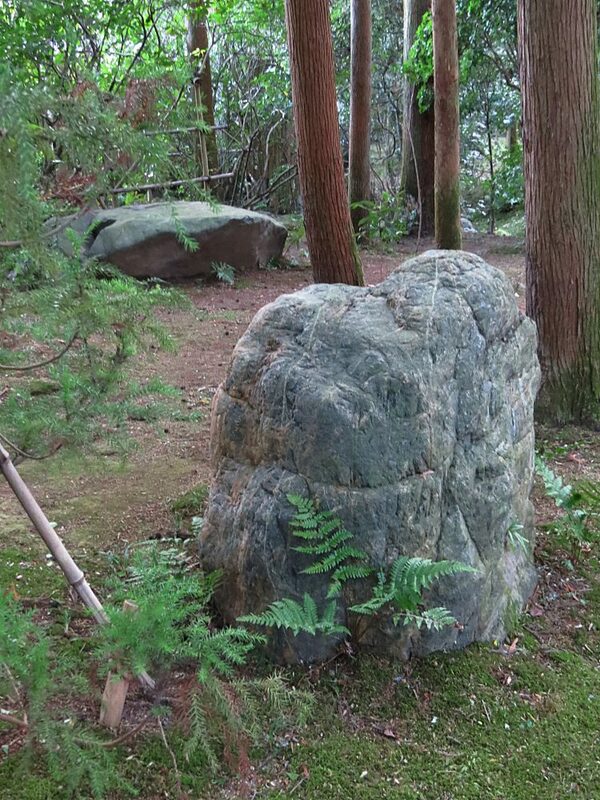 There is something mysterious about groups of stones that makes a deep impression on the human psyche, such as those at Stonehenge, Avebury and Carnac, and at Ryoan-ji this heightened awareness reaches new levels. I think it is something to do with the spaces between the stones as much as the stones themselves. The dry garden is much-photographed and familiar; the water garden and its remarkable rocks are not and there were few visitors (but some very irritating leaf-blowers) to spoil the enjoyment. Ryoan-ji is a World Heritage Site and often described as the finest of all the dry gardens, but its amazing water garden and rocks is sadly overlooked and deserves more attention. Of the twenty or so gardens I saw on my trip to Japan, none touched me as deeply as Ryoan-ji, and that is what a great garden is all about.